Here is a print I made with hand stitched background leaves. I'll put it for sale on our site shortly. And hopefully take some better pictures. This scan didn't come out great. They don't all actually live together in one forest but they are all the animals are from Southern Asia and are suffering habitat loss. 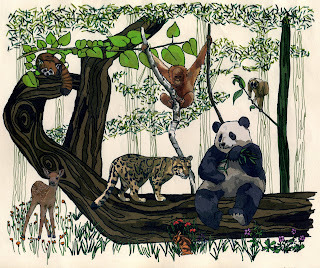 The animals are red panda, orangutan, slow loris, sika deer, bornean clouded leopard, sumatran rabit, panda.